The air compressor makes the energy (in the form of pressurized air) needed to make the blaster work. The nozzle focuses and directs that energy where you want it to go. Nozzles come in several different styles, shapes, and sizes. Texas Blaster sells straight bore nozzles. They look like a really small funnel. Nozzles neck the airstream down from 3/4 inch at the blast hose to the opening bore diameter (3/32, 1/8, 3/16, 1/4). It is this bore diameter that determines how much air volume (CFM) your compressor needs to make. The nozzle regulates how much air (CFM) can come out of the end of the hose. It also acts to accelerate the velocity of the air. Some explanation might be nice. Let’s start with the easy one. One we’ve all experienced it ourselves, accelerating the velocity of the air stream. We will use the garden hose analogy. If you turn the garden hose on full blast (this is a constant flow rate supply, the volume per minute of water coming out of the hose is always the same) it produces a full stream that shoots maybe 10 feet. Now cover the end of the hose with your thumb. That stream goes a lot further and strikes with a lot more force. Restricting the stream of water with your thumb forces the same volume of water through a smaller opening increasing the velocity (it’s conservation of energy, if your interested). If we do some math (don’t panic, we won’t actually do math) we can relate this increase in velocity to an increase in force (Thanks to Mr. Newton, the apple landed on his head guy). Think about getting blasted in the face; it can hurt if you get hit with a high-velocity jet of water. This is the exact same thing that happens with a media blast nozzle. The compressor (forget about the 80-gallon reservoir tank for this part) is a constant volume per time (CFM) device, at least for this discussion. Restricting the flow of the airstream out of the compressor with a nozzle increases the velocity of the output stream, therefore increasing the force in the stream. This force drives the media to clean the crud off that rusty car frame. Changing the nozzle also has another effect. You are changing the size of the “leak” in your air compressor. If you think about it, the air leaves your air compressor in a hose, travels through the blowdown hose on the blaster, picks up some media at the grit valve, then continues out the end of the blast hose; as a controlled air “leak”. Installing a smaller nozzle slows down the air leak; a bigger nozzle speeds up the air leak. The catch is, the compressor can only make so much air (its rated CFM). This means that you must choose to use a nozzle that makes the “leak” smaller than the compressors rated CFM. Too big of a nozzle and the air leaks out faster than the compressor can make it, resulting in too little force at the nozzle. For example, an 1/8 inch nozzle “leaks” (is rated for) 23 CFM@90 psi. If your 7 hp compressor makes 25 CFM@90 psi then there is 2 CFM buffer (25 CFM produced – 23 CFM “leaked” = 2 CFM extra) and your compressor can keep up with the “leak”. If you choose to use a 1/4 inch nozzle, rated at 95 CFM@90 psi, then the same compressor is short 70 CFM (25 CFM produced – 95 CFM “leaked” = -70 CFM shortage). 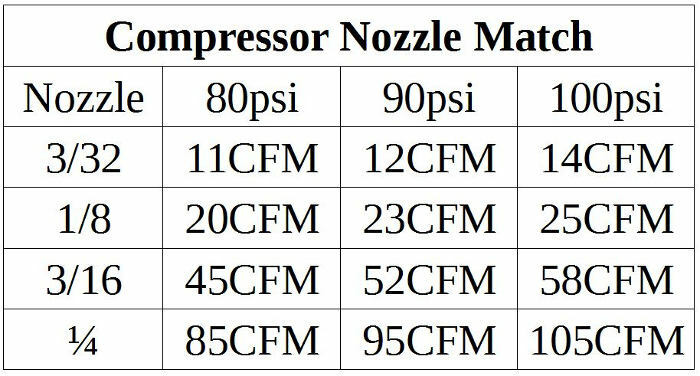 To simplify this we have created a handy table to help you match your compressor to the nozzle. * A note about the Compressor Nozzle Match Table: The table provides a generalized guide for matching compressors and nozzles. While it is fairly reliable, it is NOT set in stone. There are just too many variables: media choice, compressor hose length, blast hose length, environmental conditions, and the actual compressor CFM. The table also lists the recommend CFM at various psi (remember from the Air Compressor Lesson that CFM and pressure are related). It’s always a good idea to have more airflow (CFM) than recommended, extra is better. If you recall the air compressor lesson, we said air flow (CFM) controls the amount of work you can do. More cubic feet of air per minute means more grit per minute; which equals more rust, concrete, and paint removed per minute. Larger nozzles allow more air to move thru the system. Every time you double the opening diameter of the nozzle you do 4 times more work (this is due to the calculation of the area of a circle). So a 1/4 inch nozzle will do 4 times the work of an 1/8 inch nozzle. But, as we explained above, you can’t just install a 1/4 inch nozzle on a 7 hp 25 CFM compressor. The “leak” is too big. So you have to get a bigger compressor if you want to run a 1/4 inch nozzle. Nozzles are manufactured from a variety of materials. Aluminum oxide (otherwise referred to as ceramic), tungsten carbide, and boron carbide are three of the most commonly available. Check out the table below for a rough idea of the lifespan of each of these materials. As you can see, boron carbide last many times longer than aluminum. But, no matter the material, they still wear with use. The most noticeable symptom of wear is a drop in pressure at the nozzle. As the nozzles wear, they grow in diameter. If you recall from above; the larger the nozzle, the larger the air “leak”. As the pressure drops so does the ability for the media to do its job. This results in wasted time and effort.